Savannah, Georgia “the hostess City of the South” demonstrated southern hospitality with ideal weather conditions and thousands of enthusiastic spectators that lined the streets for the 2nd annual Rock ‘n’ Roll Savannah Marathon & ½ Marathon benefiting the American Cancer Society. The race started in downtown Savannah and ended in Forsyth Park. In the men’s half marathon, a pack of five ran together from the start, but Stephen Pifer of Jacksonville, Fla. and Curtis Begley of Boulder, Colo. battled for the top two positions. A revamped course took runners through the city’s downtown squares and the scenic campus of Savannah State University, a change that the returning women’s champion in the full marathon, Jill Braley Horst, welcomed. “It was a better course than last year, especially going through the campus. The students are always excited and cheering and a little more lively so I liked that a lot,” she said. Horst, who lives in Rome, Ga., ran alone for the majority of the way, winning in 2:52:05. Behind her was Anne-Marie Sibal who finished in 3:03:05. In the men’s full marathon, 47-year-old Jeff Mescal of Indiana became the first charity runner to ever win a Rock ‘n’ Roll event, surging at mile 18 to win in 2:43:04. Mescal was running with the race’s benefiting charity, the American Cancer Society, on behalf of his mother. Shakedra Shanks, Darlene Baltimore, Janelle Alexander, Jean Adero, and Marianne Adero-Jones. Powell ran in honor of her late father and completed the half marathon in 2:29:08. Rock band Adelitas Way performed the post race concert in beautiful Forsyth Park and Savannah’s Mayor Edna B. Jackson fired off the starting gun downtown. Men’s Full Marathon: Jeff Mescal, 47, Indiana, 2:43:04, $1,000, Joseph Hillenbrand, 28, Pennsylvania, 2:48:36,$500, and John Tolerton, 42, South Carolina, 2:48:54, $250. 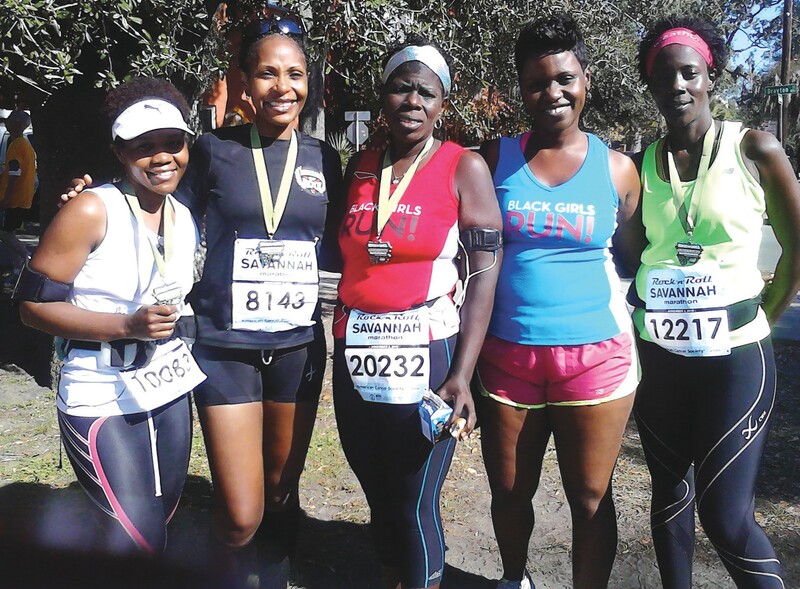 Black Girls Run Atlanta: Participates in Rock ‘n Roll, Black Girls RUN! is a national running group with 60+ running groups across the country. The mission is to combat obesity and chronic illness that plague the African American community by providing encouragement and resources to make fitness and healthy living a priority. Girls Run organization visit the website at http:// www.blackgirlsrun.com.